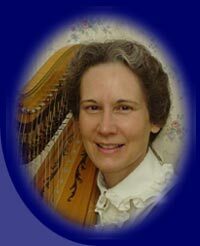 Joyce L. Hershey teaches how to play and improvise on the harp using hymns and spiritual songs along with technical exercises. With the Lord's help, she has written "Learning to Praise the Lord with the Harp," a comprehensive instruction book for beginning to intermediate levels. She was born on June 2nd, 1950 in Lancaster, Pennsylvania, to John and Ada Reba Bachman, who surrounded her with hymns and uplifting, worshipful music in their home, and took her to church where she observed the church pianist, who taught by example that it's possible to play very skillfully, and with such a worshipful attitude that the glory goes to the Lord. She studied Music Theory at Houghton College, and began playing the harp in 1983, being blessed to study with two very gifted, diligent teachers, the late Mrs. Dorothy Henschen and Mrs. Phyllis Ensher-Peters, who were both students of Salzedo. In 1971, she was married to Leon B. Hershey, Jr., who has diligently sought to lead their family in ways that honor the Lord. They have been blessed with precious children . . . a son Keith, and his wife, Carol, and their four children . . . and a daughter, Cherie Lynn. They enjoy special worship times together as a family. The years have been filled with blessings and challenges, but they have seen the Lord's faithfulness to all His promises. Joyce is continuing to arrange hymns and spiritual songs, and seeks to play, and teach others to play, skillfully and worshipfully, in a way that brings honor to the Lord Jesus Christ. Copyright © Refreshing Springs, Inc.